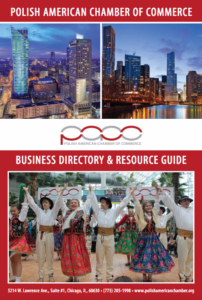 Established in 1994, the Polish American Chamber of Commerce (PACC) is a not-for-profit organization incorporated in the State of Illinois as a business association. The Chamber is dedicated to fostering its members’ business interests, educating and facilitating commercial contacts, and building relations. As the voice of Polish American business men and women in the Chicagoland metropolitan area, the Chamber’s goal is to serve their best interests and help influence decisions and actions, which improve their economic vitality. The Chamber is also at the forefront of encouraging and promoting domestic and foreign trade to benefit its members, the community, and the State of Illinois. Its goals include promoting our members businesses and enhancing trade relations between the US and Poland. Chamber members are businesses, organizations and individuals concerned with the socioeconomic climate of our community. Most are from the Chicago area, which includes the thriving premiere community of thousands of Polish American business owners, and a growing number are from outside Illinois, including Poland. They have joined together because they know they stand a better chance of getting things done when they speak as one voice. The chamber takes pride in its rapidly growing list of members drawn from retail, commercial and industrial businesses, as well as professionals and other citizens. Click here for the Member Directory!